I am just back from spending a few relaxing days on the boat mixed in a with a little bit of work. However my time aboard would have been even more relaxing were it not for half of the sail boats in the marina having loose halyards flapping against the mast. The constant ping, ping, ping drives me crazy and keeps me awake at night. The last few days we have had strong north east winds up here in New England which has made for some very enjoyable sailing but when I get back after wards I like to sit in the cabin read a book and have a glass of scotch. I also like it quiet but the sound of those ropes drives me insane. I did a little math while lying awake at night too. The frequency of the rope hitting the mast happens about 70 times a minute, irrespective of the height of the mast. That equates to 4200 hits per hour and 100800 pings in a 24 hour period. Not only does this drive anyone nuts but just think of the wear to the mast and the ropes. Multiply this by the other 20 boats in the marina making a similar noise and you can understand why I might be a little grouchy in the morning. Please tie the halyards away from the mast when you leave your boat, your neighbors will thank you and so will your boat. I have a friend who is a lobster fisherman and he like all the other lobster men has had to change the ropes between the trap and buoy this year. It's all part of plan to prevent right whales and other mammals from becoming trapped in floating and discarded rope. As from the this year it is now mandated that all trap rope has to be sinking type but of course that leaves the problem as to what do you do with the old rope. Of course much of it will end up in dumpsters and landfills but as sure as eggs are eggs someone else will find a use for the old stuff. Enter the Maine Float Rope Company who have developed a business do just that, weaving door mats out of the old rope. What a neat idea and the perfect use for an old polypropylene rope that would otherwise be simply thrown out. The bowline on a bight forms two loops, which if the knot is tied correctly will be of the same size. Easy to tie it does none the less require a little bit of practice so that it can be tied swiftly and properly. In the bight of the rope or in other words the section of rope where the the knot is desired form an overhand loop then pass the working part of the rope through the loop coming up from the underside. After passing the working section through the loop grasp the middle of the working section and pull it down towards you as shown. Pull on the two loops formed to snug up and complete the knot. As ever the best thing is to practice until it becomes second nature. The bowline on the bight has a lot of uses and I have even used a series of them in one piece of rope which spaced at regular intervals makes a rudimentary but effective rope ladder. You can click on the images to make them bigger as always but for additional help click here for an animation of how to tie this knot. I have a friend who is in the process of building one of James Wharram's Tiki 30 catamarans. There are lots of innovative features to these boats which are both simple and pleasing to look at. 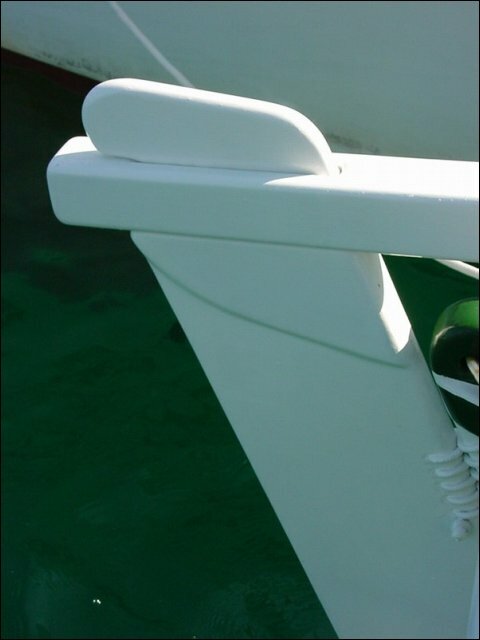 One of the most innovative features that I have seen on these boats is the use of parachute cord as locker lid hinges. Both cheap, very strong and surprisingly effective the cord is probably stronger than many a proprietary hinge. In fact the hinge idea works so well that it has even adapted and adopted a similar method for attaching the rudders to the boat. Brilliant, I wish I had thought of it first. The rolling hitch is very useful knot to learn as it allows you to apply take the strain off another line or rope that is itself already under tension. It can be employed successfully for taking the strain off a rope that has a riding turn on a winch drum which unless the strain is released the only other alternative to free the line is to cut it, which will often render it useless. As ever you can click on the pictures to make them bigger so you can more easily follow how to tie the knots. Step 1. Take a turn around the rope under strain which for the purposes of this series of photos we are assuming is the white one. Step 2 Take the working end of the rope around the rope under strain for a second turn, bringing it around on the inside of the first tun , in other words closer to the standing part. Step 3. Pass the working end over the top of the rope under strain and bring back up passing it under itself. Step 4. Snug everything down. Strain can now be applied to the standing part of the rope which will not slip thus enabling you to sort out the mess on the winch drum or whatever. TIP. It also works well with chain. After anchoring for the night a rolling hitch tied around the anchor chain then taken back to a deck cleat or bollard allows the strain to be taken off the winch gypsy and prevents the constant rattle of the chain from keeping you awake at night. I'm posting this blog entry at the suggestion of my marina neighbor Shannon after I spent half an hour going around the docks tying off flapping halyards. Walk around almost any boat yard or marina and you are sure to hear the rhythmic ting, ting, ting of rope frapping against the mast. As the wind picks up as it has today this cacophony only gets worse. It irks me that perfectly sane people let ropes bang against the mast like they do,not only is the noise extremely annoying but it wears out the rope and strips the anodizing of the spar and I hate to see that. All that is needed is a bungee cord to pull the offending halyard away from the mast, I tie mine off to a convenient shroud. It only takes a moment and your neighbor who is trying to get some sleep below will thank you for it. Look around almost any anchorage and you can spot the serious long distance voyager; extra fuel cans tied to the deck, wind generator and solar panels and most likely if my boat is anything to go by a couple of gently rusting bicycles strapped to the pushpit. Look closer and you might also spot some netting strung between the lifelines and toe rails. When correctly done netting makes a wonderful addition to almost any boat. Originally I started to use it aboard 20 years ago to prevent my son Sam from going over the side by sliding under the lifelines but I quickly realized as time progressed that there were other benefits too. Large headsails no longer fell into the sea as I wrestled them to the deck in less than perfect conditions and there was a psychological advantage when we took novice sailors out who felt a little more like they were in the boat rather than sitting on top of it. Installing netting is a straightforward job but it does really require two sets of hands, you can do it on your own but it takes much longer and is easy to tangle everything up, get frustrated and generally make a mess of it. Netting comes either in a roll or can be bought by the foot, measure carefully because it is easy to buy too much as netting stretches a good amount. Know the length between the pushpit and the pulpit by measuring along the top guard rail wire and have this in your back pocket when you go to buy. It may seem like stating the obvious but it is pointless spending time rigging netting unless your guard rails and stanchions are in tip top condition. Check them and tighten any wires that are loose and consider replacing any swaged fittings that are bent, cracked or at all suspect. On the face of it plastic cable ties would appear to be the perfect product for attaching the netting to the boat but bear in mind that they are degraded by UV which tends to make them brittle and fail. Periodically check them by giving one or two a good tug, if they break easily replace them. I prefer whipping to cable ties as they are kinder to bare feet and hands and can be cut easily in an emergency with a knife but it is all down to personal preference. One final word and that is that the netting like anything else on the boat will require some maintenance, not a lot but at least give it a good visual check once or twice per season and remember that it could be you that it prevents from going over the side. One of the easiest and quick to tie the sheet bend is the most common method for joining two ropes together. Here's how to tie it. As always click on the pictures to make them larger and easier to see. 1. Start by forming a loop in the end of one of the ropes then pass the end of the other rope through the loop. 3. Pass the to the front of the knot and then back under itself. 4. To finish the knot work everything up tight as shown which will lock everything together. 5. For extra security on rope of differing diameters or ropes that are slippery pass the working end around the back of the knot a second time as shown.